The 1981 Phazer Prototype with handbuilt frame by Ron Vigneri is shown in its latest revival form. The Prototype frame and fork set had been on display hanging on various shop walls for over thirty years. The frame and forks had originally been red oxide primed and painted Joanne Ettenborough Vigneri Yellow. 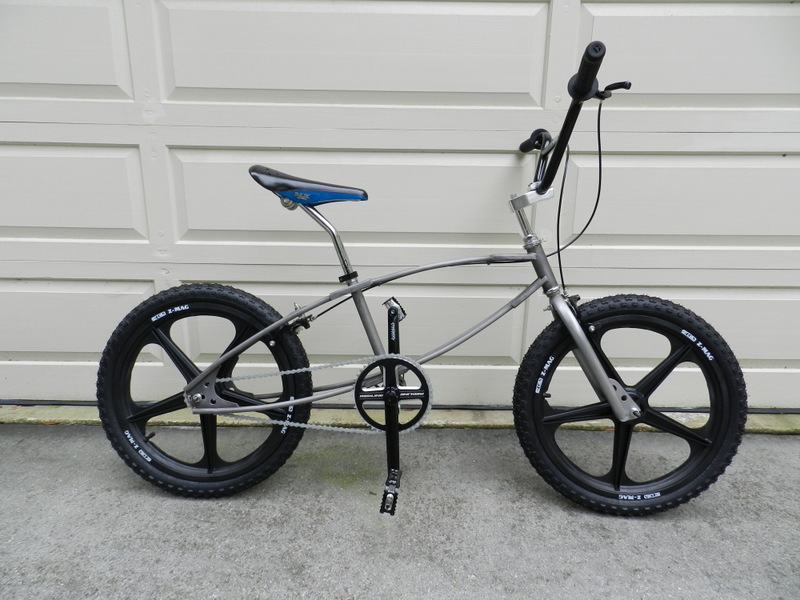 It was sandblasted by Rich Vigneri at his shop in Wilmington, NC and clear-coated for a chromoly "Patina" finish by Ron. After the recent sale of the 1981 Phazer #3 (thought to be the only surviving genuine production unit), Ron decided to again build the Prototype with old school and NOS parts. 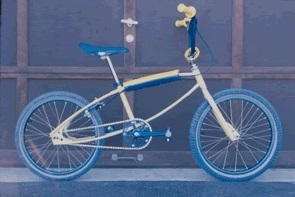 Originally, the Prototype had been built with mostly Speed Unlimited and Shimano parts and test ridden. Then the bike was stripped down to the frame to be used as a template for a 100 unit production run that included some moderate production design modifications like egg-shaped main tubes instead of constant radius, foldover tube head mount (upsid-down u-shape), and rearward seat tube relocation (it was located symmetrically to the constant radius frame tubes on the Prototype). 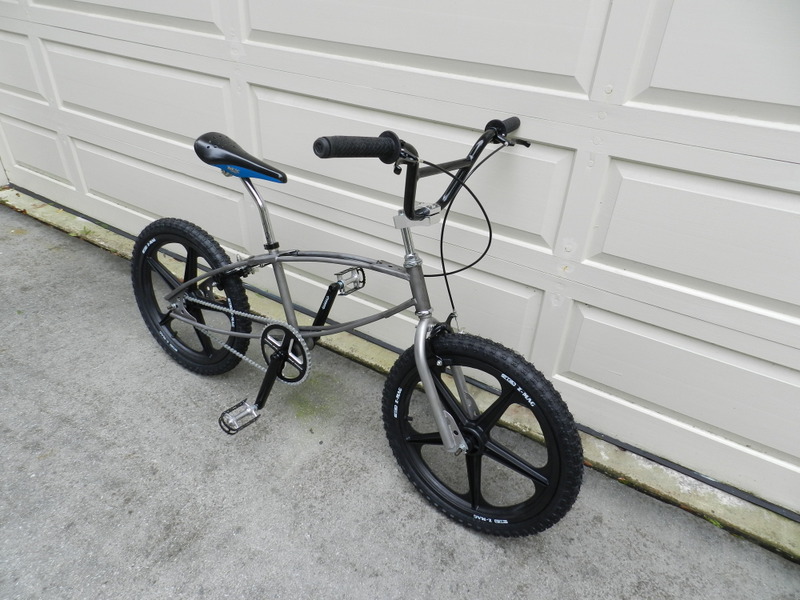 This web page presents the newly outfitted 1981 Phazer Prototype and the original history of this still novel bike design. The bike specs and parts are listed after the text of this article. Parts were supplied by Ace BMX, Johnston City, NY (acebmx.com and americancycle.com) and Two Wheeler Dealer, Wilmington, NC (bikesarefun.com). 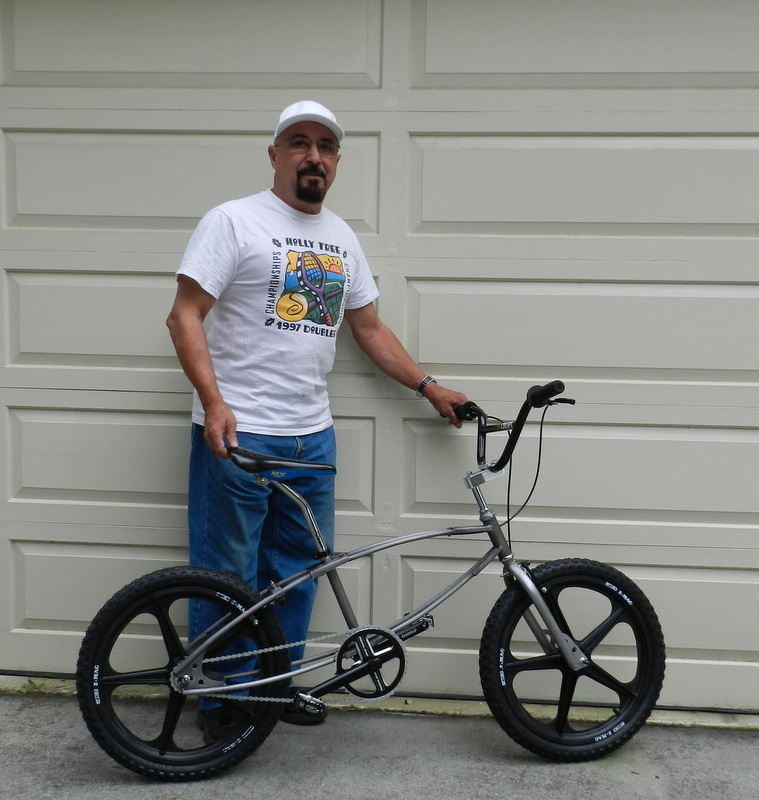 The inventor/builder of the Phazer BMX bike is pictured with the completed new version of the 34 year old design which weighs 23.8 pounds. 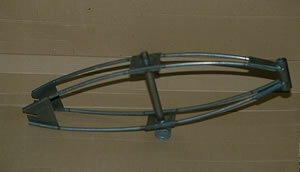 The following pictures show a bike frame invented in January 1981 by Ron Vigneri while watching television at his home. He and Slammin Sammy Miller were watching television one evening and Ron had a design idea he sketched on the back of an opened mail envelope. The first Phazer frame in January 1981. Ron showed the design to Sammy and he thought it was very interesting. 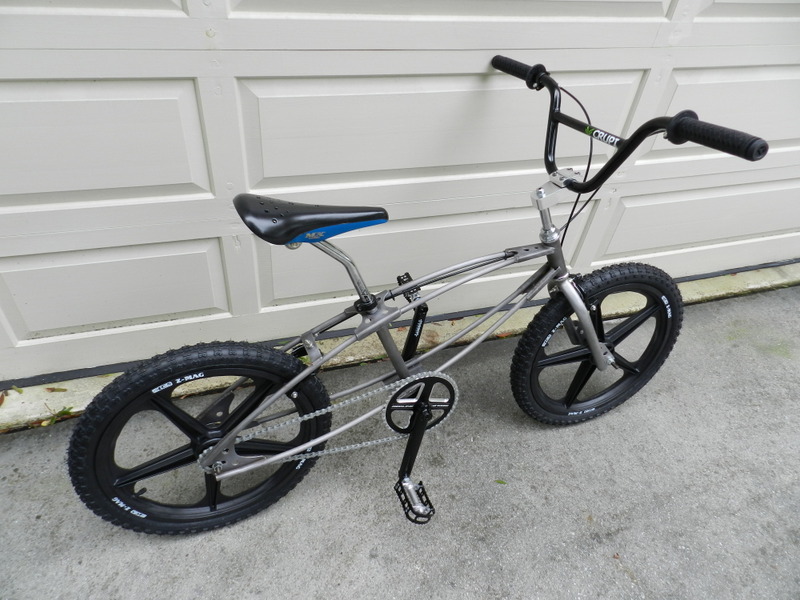 The next day some 1/2" chrome moly tubing and plate for the frame was ordered with the rest of the parts to build a complete bike through Tom Daniels, Manager of Speed Unlimited where the Thruster BMX bicycles were built. I also showed the sketch to Lee VanOrmer, the CEO and lead investor in Speed Unlimited, and he was very interested in producing the bike through his company, but was having company financial problems. 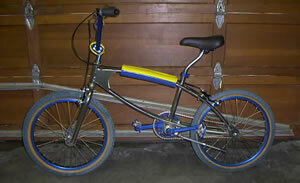 Sammy's deceased father had founded the bicycle company, Speed Unlimited, located in Wayne, New Jersey. The first Phazer in January 1981. The design to the frame was novel in that the main idea was to build a frame that would not require a tubular frame member end to be welded into the side of another tubular frame member. The welding of a tube into the side of another tube required a radiused cut on the end of one member and a mechanical jig to hold the two tubes in proper alignment before welding. The new design would speed the setup, eliminate the radiused end cutting, and eliminate the requirement for a jig. The new frame design basically "jigged" itself, besides being stronger and lighter due the smaller tubing diameter that could be used. Plus, the frame could be made with a selectable stiffness by preloading the main tubes axially before welding the plates. And besides all that, the new frame design just looked "cool". The first Phazer frame was symmetrical about the seat post. Phazer in primer coat after first assembly. Ron wrote and submitted a patent application to his attorney, Art Jacob, after the parts were ordered. When the parts came in about 1 week later, the first Phazer frame was built in the Miller family garage along side the rocketcar, Oxygen (being prepared for the ice speed record). Ron hand radiused the four main tubes and fabricated the frame plates and used Thruster parts for bottom bracket and headset. George Garboden of GG Industries, MIG-welded the first frame assembly. Ron took the staged picture below showing Sammy and George trying to bend the Prototype welded frame. Oxygen, rocket powered dragster, and land speed record frame (on the wall and the next rocket car to be built) are in the background. 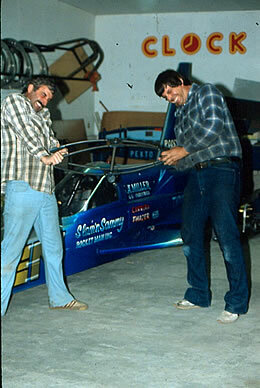 Slammin Sammy Miller and George Garboden trying to bend first Phazer frame. 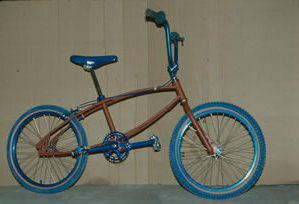 The rest of the painting and assembly of the first Phazer BMX bike was done by Ron in his Kinnelon, New Jersey barn at his home. The assembled bike was then tested on the BMX track built on West side of the 8.5 acres at American Tennis & Country Club in Kiinelon. It passed all the test rides and was prepared for its first public showing at the 1981 New York Auto Show at the NY Colisium along with Oxygen. 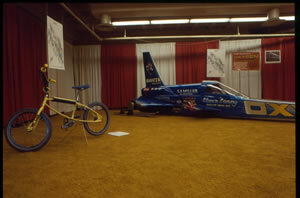 Phazer on display with Oxygen at the 1981 NY Auto Show. The Phazer activity was shelved by Ron after noting to make some intended production changes (head bracket plate, bottom bracket position, seat tube angle and position). There were 5 production Phazers built by Ron, George, and Sammy to start a run of 100 units funded by Ron. All the units were sold in about a 3 month period and no further production by Ron occurred. The ice speed record activity and subsequent oil well treatment system development took all the time Ron had available. Sometime around 1985, Ron was informed that Sammy and a Dutch rocktecar driver, Henk Vink, were building and selling a version of the Phazer in Europe named the Rocket X-1. It was a knockoff of the Phazer ripped-off by Sammy and Vink. Ron had a friend and former employee, Jim McGlashan, buy a Rocket X-1 which he still has. Sammy claimed in Europe that he invented the bike frame. Also the Thermox gas generator, but that's another story. Ron received many more patents in multiple disciplines over the next 25 years after the split with Sammy. It is interesting to note that the opposite didn't occur. Phazer (built by Rocket Man Inc. S/N 3) built in 1981 in the USA. Handlebar Crupi Moto Expert Alloy 26" x 6.5"
Freewheel ACS Single Speed 16T 1/2" x 1/8"
Chain KMC Z-Chain 112L 1/2" x 1/8"
Tires Kenda Sunlite M-50 Knobby 20" x 2.125"
Tubes Goodyear 20" x 2.125"